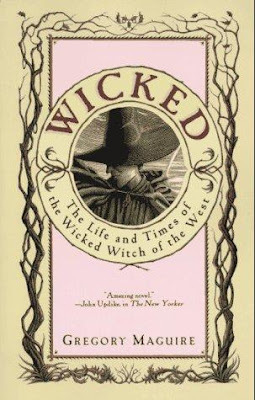 Anyway, one of the first post-grad books I read is Wicked, by Gregory Maguire. I started this book mainly because I was at the bookstore picking up a gift for my little sister, and "The Ukrainian" picked up some other Maguire books and told me to read this one. He's had it on his bookshelf forever, and I told him that when I had the will to read again, I'd read it. Well, word fulfilled. The book is long, but it went by pretty quickly, for the most part. Not knowing anything about the Broadway version of this, I only knew that it would tell "the Witch's side of the story." I was expecting some sort of fantasy novel, though I'm not a big fan of that genre. Fortunately, to me, this was more of a story of an unusual individual (Elphaba) with intriguing interactions with the people and society around her. I won't spoil too much of this book, but it is really well-written. The third quarter or so of this book was a little hard to get through (probably because it required more focus), but overall, I liked reading about her growing up and was left sort of... confused?... when she meets the familiar Oz characters (Tin Man, Dorothy, etc.). It really does provide "another side of the story" to The Wizard of Oz without making anyone seem particularly evil or good. This book, which I don't recommend to anyone under 18 (sorry! :$), combines philosophy, politics, and religion into this story. It definitely exceeded my expectations. As proof of how entertaining I found this book, I have started reading Son of a Witch by the same author, which I also borrowed from "The Ukrainian." Don't worry... this blog isn't going to become solely a place where I give my weak interpretation of novels. If you click my "books" tag (below), you will see that for the most part, I review running/fitness books. Expect some of those reviews soon, too! Okay. As a kid I pretty much thought I was Dorothy. Like obsessed beyond obsessed with Wizard of Oz. So A. It's so odd I've never been to NY to see Wicked. B. It came here and I never made it. C. I TRIED to get into the book and couldn't! Ugh. I need to give it another chance!! !